The one case that requires special attention is where an audio frame overlaps with the start of the new media segment. The base level behavior that must be supported requires dropping the old audio frame that overlaps the start of the new segment and inserting silence for the small gap that is created. A higher quality implementation could support outputting a portion of the old segment and all of the new segment or crossfade during the overlapping region. This is a quality of implementation issue. The key property here though is the small silence gap should not be reflected in the ranges reported by buffered. The duration attribute allows the web application to set the presentation duration. The duration is initially set to NaN when the MediaSource object is created. Note: append() and endOfStream() can update the duration under certain circumstances. Note: This allows the duration to properly reflect the end of the appended media segments. 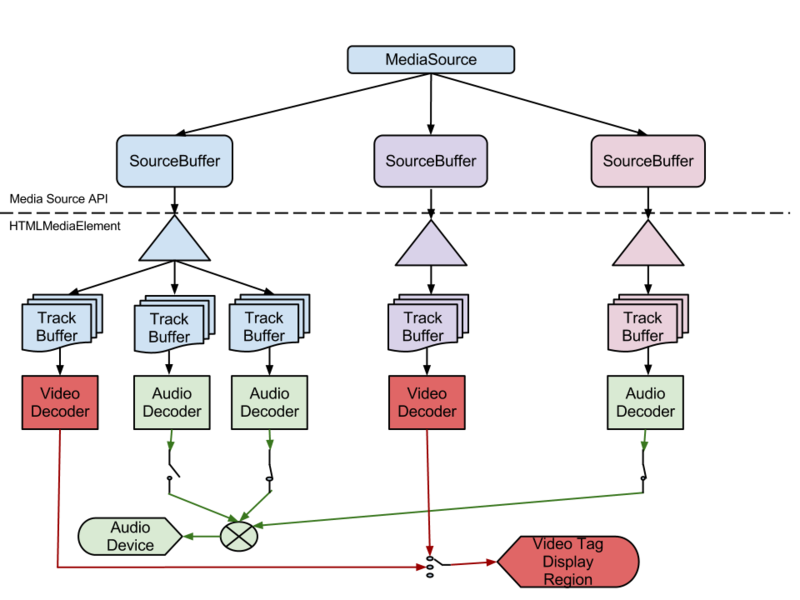 For example, if the duration was explicitly set to 10 seconds and only media segments for 0 to 5 seconds were appended before endOfStream() was called, then the duration will get updated to 5 seconds. Run the "If the connection is interrupted, causing the user agent to give up trying to fetch the resource" section of the resource fetch algorithm. Run the "If the media data is corrupted" section of the resource fetch algorithm. Set readyState attribute to "open". Set readyState attribute to "closed". Set duration attribute to NaN. // Applies an offset to media segment timestamps. If this object has been removed from the sourceBuffers attribute of the MediaSource object that created it, then throw an INVALID_STATE_ERR exception and abort these steps. If the readyState attribute of the MediaSource object that created this object is not in the "open" state, then throw an INVALID_STATE_ERR exception and abort these steps. If data contains anything that violates the byte stream format specifications, then run the media element's error handling code to signal a MediaError.MEDIA_ERR_DECODE error, and abort these steps. Find all timestamps inside data and add timestampOffset to them. If any of the modified timestamps are earlier than the presentation start time, run the media element's error handling code to signal a MediaError.MEDIA_ERR_DECODE error, and abort these steps. Copy the contents of data, with the modified timestamps, into the source buffer. Copy the contents of data into the source buffer. Run the duration change algorithm with new duration set to the maximum of the current duration and the highest end timestamp reported by HTMLMediaElement.buffered. The Media Data Boxes must contain all the samples referenced by the Track Run Boxes (trun) of the Movie Fragment Box.